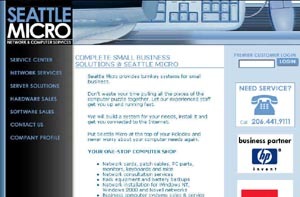 Seattle Micro needed a modern look to showcase their expanded IT support and a new product line. Seattle Micro is one of the oldest computer support, repair and sales outlets in Seattle, and they needed a new look and feel for their company. We created a new logo design used on their employee shirts as well as the web site and we developed a new brochure.